The Bronx Zoo is a great place for Scouts of all ages to learn about animals, conservation, and more! Calling all Girl Scouts! Girl Scout Troops are invited to spend the day exploring the zoo and engaging in some special scout-themed activities. Art and activity stations as well as themed tours will be part of the fun. Along with providing general admission to the zoo, our new Nature Trek exhibit will be available for you to explore! All Scout participants will earn a Bronx Zoo Scout Day patch! Join us for an overnight adventure at the Bronx Zoo. You and your troop will the opportunity to experience the Bronx Zoo after hours and discover your inner naturalist. Participating in live animal encounters, exploring select zoo exhibits, and creating animal enrichment will all be part of the fun! Wake to the sound of sea lions and get early access to select exhibits before the zoo opens to the public. Time: 4:30 p.m. - 10:00 a.m.
Scouts will learn what animals need in order to survive and how the zoo cares for the animals that live here. Scouts will build their own animals homes and learn how they can help care for animals in their community and out in the world! This workshop fulfills some (but not all!) of the requirements for the "5 Flowers, 4 Stories, 3 Cheers for Animals" journey. Contact us at bzeducation@wcs.org or 800-433-4149 for more information or to schedule your scouts! Class Size: We can accommodate a maximum of 40 people in our classroom. We require 1 adult for every 10 scouts. Brownies will work towards earning their Bugs Badge by learning about insects and why they are important to our world. We will visit some bug-themed exhibits, meet a special bug animal guest, and create insect-inspired art! Contact us at bzeducation@wcs.org or 800-433-4149 for more information or to schedule your scouts! Junior Girl Scouts will work toward their Animal Habitats Badge by exploring one of the most amazing animal habitats - the rainforest! We will explore rainforest exhibits at the zoo, meet some special rainforest animal guests, and create rainforest terrariums! We will also discuss threats facing this habitat and the animals that live there, and learn about what we can do to help. Contact us at bzeducation@wcs.org or 800-433-4149 for more information or to schedule your scouts! Brownies will work toward earning their senses badge by meeting some special animal guests and learning how animals use their senses to survive and thrive. 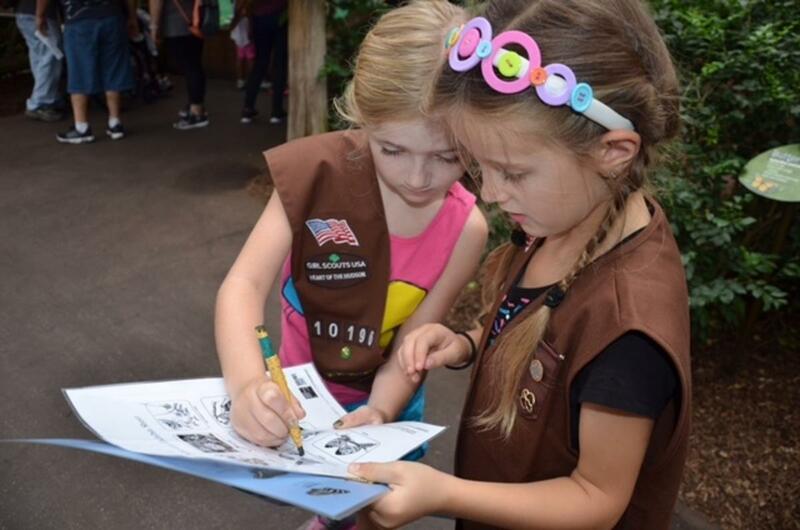 Scouts will have the opportunity to use their senses to understand the animal world through creating a senses-themed craft and completing a senses scavenger hunt in the zoo. Contact us at bzeducation@wcs.org or 800-433-4149 for more information or to schedule your scouts!